Sèvres bleu céleste orange tub with well painted reserves by Jean-Louis Morin depicting two panels of theatrical subjects, one of Geography, and one emblematic of Love. 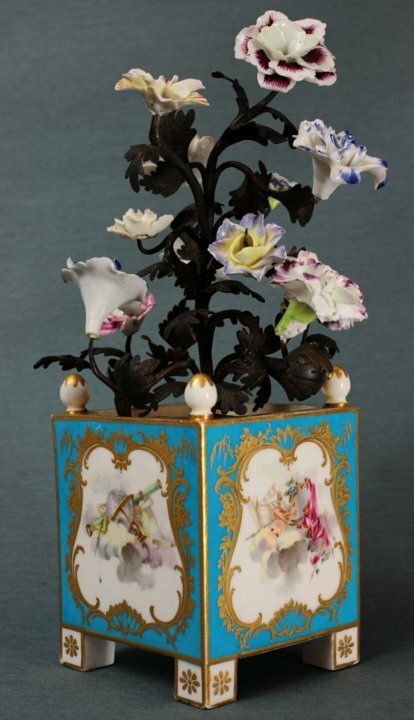 The porcelain is fitted with a patinated bronze bouquet of porcelain flowers inset onto a well chased piece of ormolu simulating the earth from which the flowers are growing. The reserve of Dramatic Art (showing a script of Tartuffe) is also found on a tureen from the Maria Theresa service (1757); on an orange tub (Nº44) and on a jardinière (Nº 29) at Waddesdon Manor. The panel depicting the attributes of Love shows an open book with the letters “…ACREO…” visible, possibly part of the name “Anacreon,” a famous Greek love poet.